It seems of late whenever I make cheese I do it in a flurry of activity, which results in me making a number of cheeses or other cultured products over the course of a weekend. The downside to this is when I write about my experience with this blog, the posts tend to get big, unwieldy and time consuming to produce. For example the subject of this post was made on the same weekend as 3 other cheeses and one cultured product. So I will write about and post them separately. One benefit of this to the reader is I can watch a cheese develop in the cave and report on its progress in the same post where I describe how I made the cheese. So on to this cheese make. I suspect the title of this post caught your attention. Goat Droppings is the literal translation from French of the cheese make I will describe today. The cheese is called Crottin. I love almost every French cheese I have every had the fortune of sinking my teeth into but Crottin is one of my favourites and yes to the embarrassment of my children I have left drool marks on the window of a Sancerre Formagerie that had a lovely display of Crottins in the window. Sancerre is about 5 km from the village of Chavignol, a town in the eastern Loire Valley of central France known for the quality of their Crottin. Crottin de Chavignol is the most famous goat cheese of the many varieties produced in the Loire Valley. This cheese is the claim to fame for the village of Chavignol, France, which has only two hundred inhabitants. The small cylindrical goat cheese from the area around Chavignol has been produced since the 16th century, but it wasn’t until 1829 that it was first written about. The etymology is dubious: the word “Crot” described a small oil lamp made from burned clay, which resembles the mould used to prepare the cheese. Another explanation is that old Crottin gets harder and browner and tends to look like dung, the French word for an animal dropping being crotte. Protected by the AOC Seal, Crottin de Chavignol is produced today with traditional methods. If a cheese is labeled “Crottin”, it is of the Crottin type, but to be labeled “Crottin de Chavignol”, it has to be from the area around Chavignol, and it has to meet the stringent AOC production criteria. 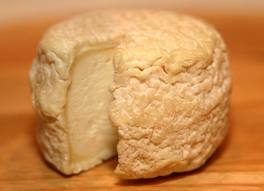 The flavour of Crottin de Chavignol is subtle and slightly nutty. In its youth, its dough is solid and compact, and its rind is white. 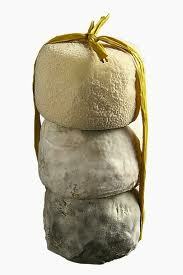 As it ripens, the dough becomes crumbly and the mould on the rind matures into a bluish colour. The bluish colour doesn’t mean that the cheese is no longer edible—quite the opposite. So now you have the rest of the story; I prefer goat droppings as the literal translation. 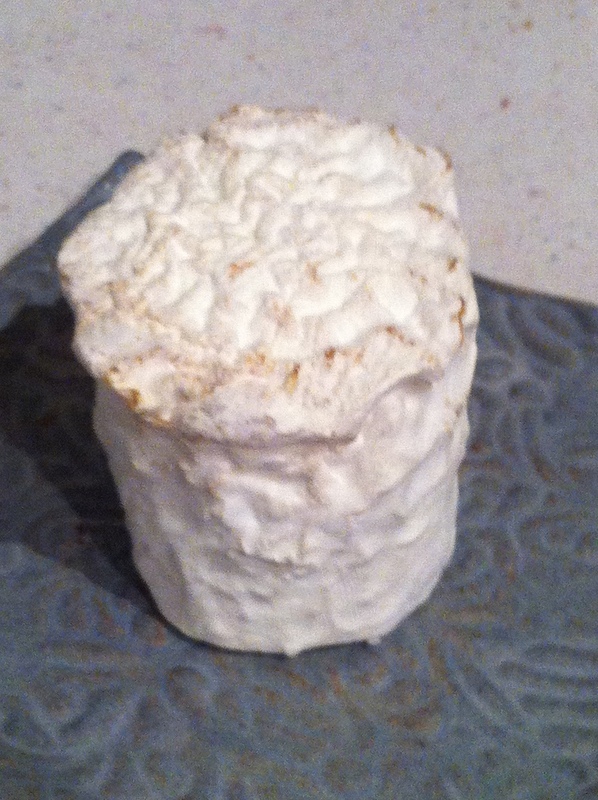 Here are a few photos of Crottin from the Internet so you will be able to compare them to my cheese make. Lets see how mine stack (or should that be pile) up. I have found Crottin for sale here in Edmonton on occasion but the last time I purchased one it was about $10.00 or if you are stupid enough to do the math….$100/kg; definitely for a special treat and it also provides a strong persuasion to learn to make your own. For this recipe I followed the recipe in “Making Artisan Cheese” by Tim Smith. The recipe uses a gallon of goat’s milk, direct set Flora Danica culture, Geotrichium candidum, liquid rennet, calcium chloride and 4 crottin molds. This is an easy cheese to make. 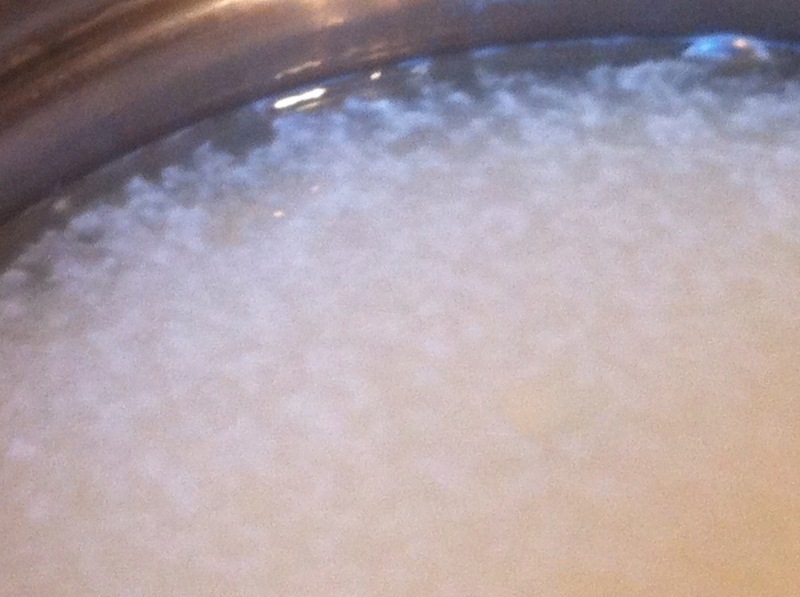 Heat the milk to 72°F (usually room temperature), add the culture and mix well. Rest for 20 minutes maintaining the temperature. Add the calcium chloride, rest 5 minutes. Stir in the Geotrichium candidum and the Penicillium candidum and then add the rennet. Cover and keep the milk at the target temperature and the curds will form in 18 to 20 hours but sometimes up to 24 hours. I was busy the next day so I left the curds form for another 24 hours. When I took the lid off the pot there was a white scum/skin on the surface, which I skimmed off. 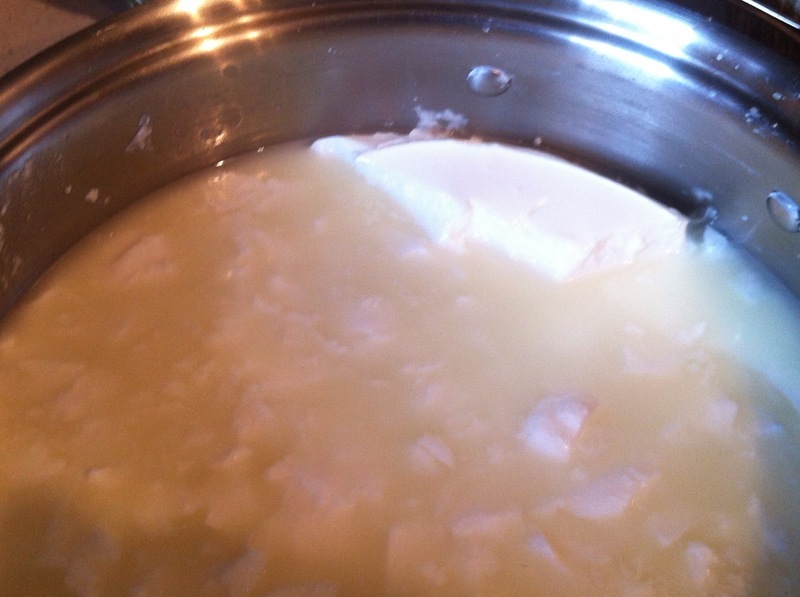 The curds had set nicely and there was a good clean break and the curds had pulled away from the edge of the pot. 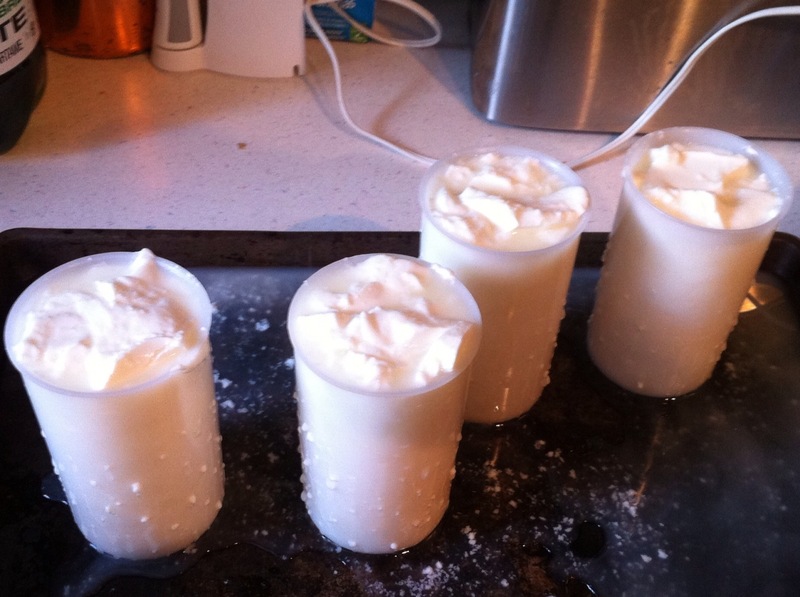 I ladled the curds into the molds, filling them to the top. I kept adding curds as the level subsided. To speed the process I took the last of the curds and placed them in a muslin-lined colander to drain the whey and then added to the molds as room permitted. 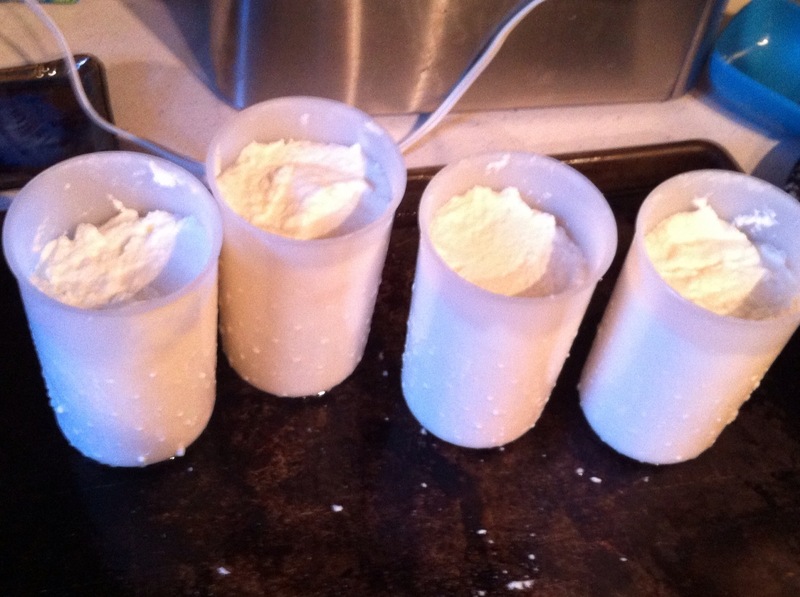 Eventually all of the curds fit into the four molds. I left the molds to drain for 3 days before removing the cheese from the molds; at which time I sprinkled them with salt. The recipe said to let them drain for 24 hours or until the cheese pulls away from the edge of the molds. 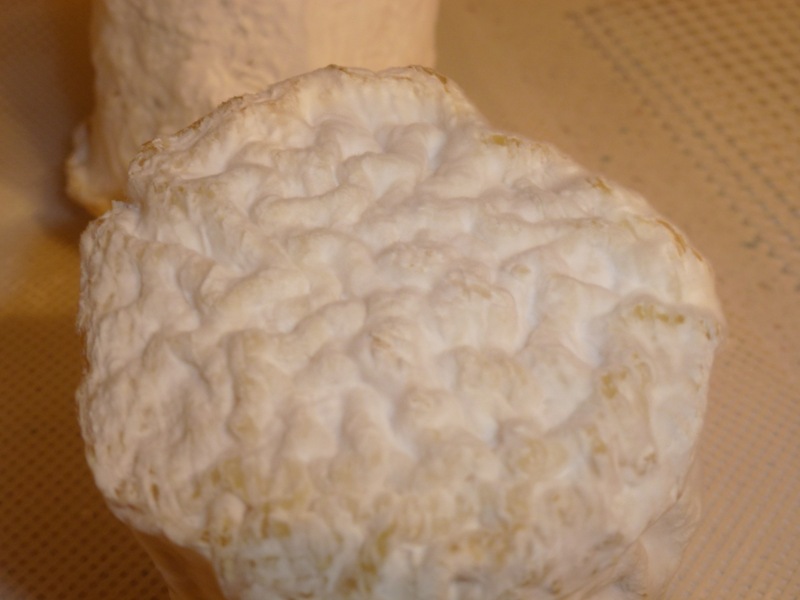 The tops of the cheese had already started to develop a nice Penicillium candidum covering. 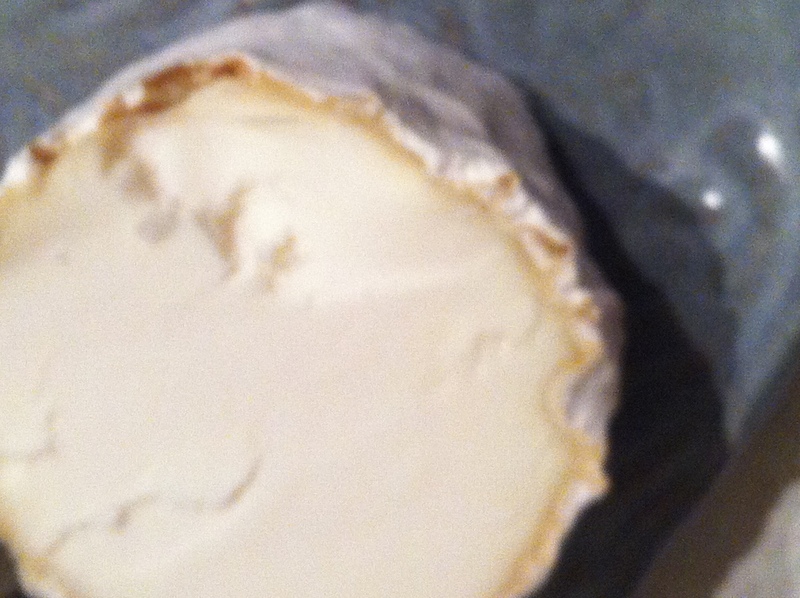 I placed the Crottins in the cheese cave at 13°C and 95% Relative Humidity. I flipped the Crottins once each day and they were soon fully developed on all sides with the Penn.c..
An interesting brain pattern (according to Lorrie) has developed on the rough tops of the Crottins. 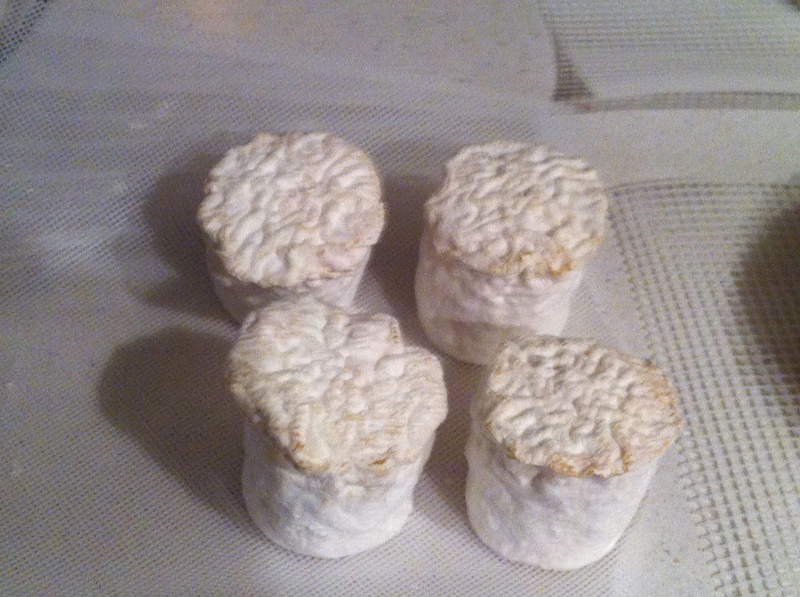 I have to be honest these look more like tall Brie rather than Crottin due to the well developed Pen. c.. Each time I flip them I feel like taking a bite out of one of them; they are sooo tasty looking, but I know patience will reward me with an even better aged Crottin. My Crottins are more the size of horse droppings, rather than goat droppings. I may need to get 4 more molds but I will wait and see how these ones turn out. The recipe did not mention flipping the cheeses in the molds as they are drying; thus one end is nicely rounded and the other is rougher (but has the neat brain pattern) so they are rather ‘rustic’ looking. When I reviewed some other recipes they recommended flipping the cheeses in the molds, the photos in the recipe book I used also mention that these Crottin “…are commercially made; homemade wheels will be larger and less uniformly shaped”; so I may experiment next time. I sampled one of the Crottin 22 days after they were made. 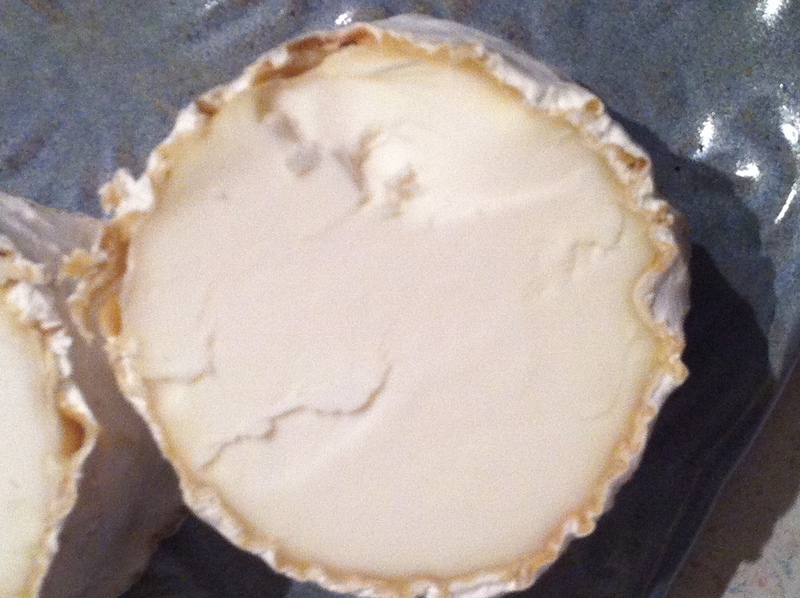 There was a well developed rind, the interior was firm but still creamy in the mouth with a mild goat taste. I thought it would be stronger flavoured which may develop with age. I will probably sample another in about a week when they are about one month old. Beautiful Rick, absolutely beautiful. Have you thought about wrapping them so they can age longer? Yes but I wasn’t sure how long to leave them before wrapping. They are a few days shy of a month old. Very interesting. Ron and I have a friend who is a cheese guy he would just love this. Looking forward to your next cheese. Thanks! I have one more cheese to write about already, just need the time. Way to go Rick Very interesting tasting should be fun. This is such a good and instructive post. I can’t wait to try this out again. Thanks Addie, I look forward to working on our goat ‘project’.